It’s almost America’s birthday week! We celebrate birthday “weeks” in our house, so I guess we’ll do the same for our good ol’ USA! She’s good to us, so we’ll be good to her. Shoot, now I’m thinking I need to schedule a beach clean-up day or something! 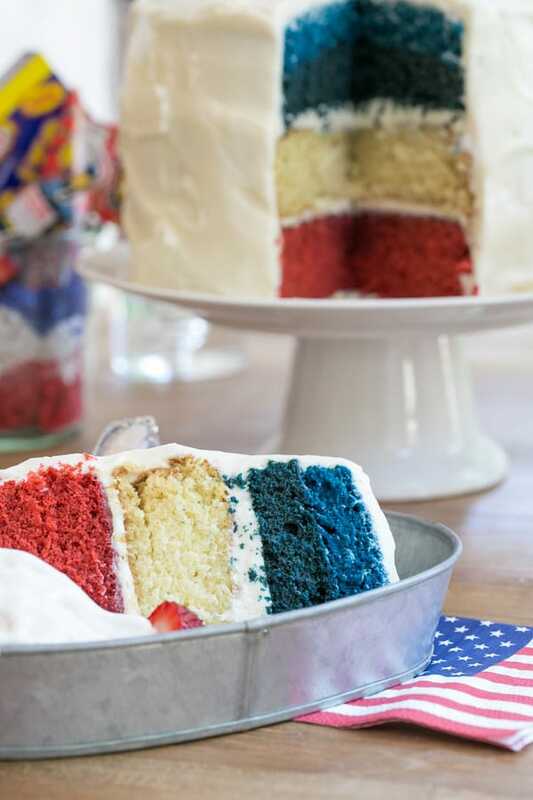 Anyway, if you’re hosting a 4th of July BBQ or having a few friends over for dessert and fireworks I have a delicious Red, White and Blue Velvet Cake recipe (adapted from my fave Cooks Illustrated) and one heck of a good bourbon whiskey punch. What really says American more than red velvet and whiskey? Okay, maybe beer and McDonald’s, but we’ll skip those for now! 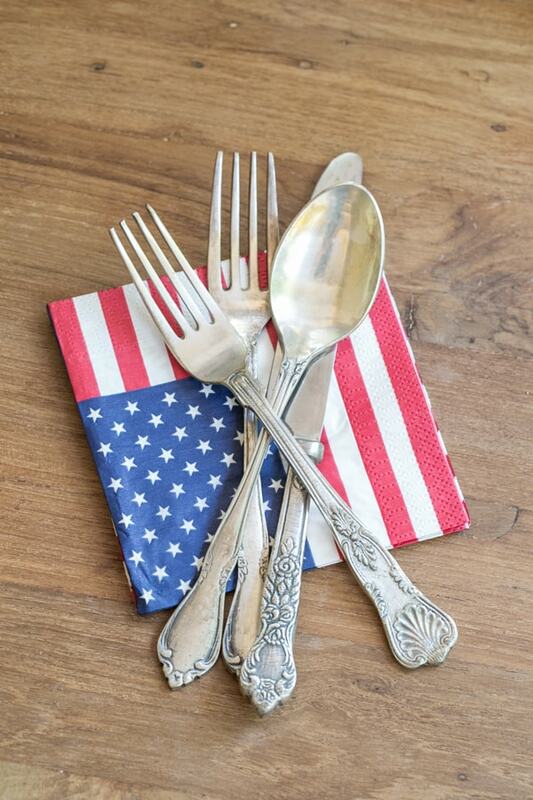 Sooo, below are some festive and easy entertaining ideas for hosting a 4th of July par-tay! Be safe and enjoy! 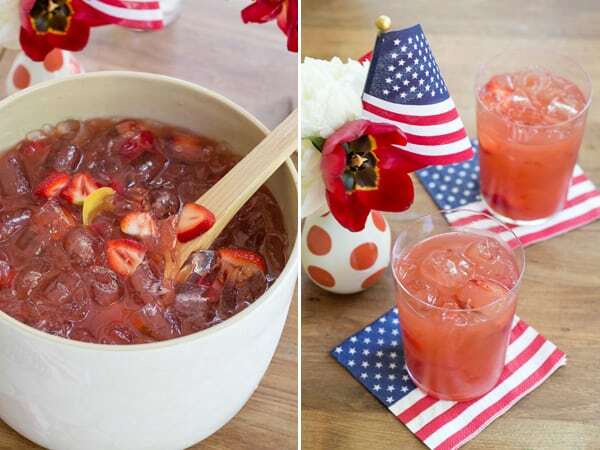 Forget individual cocktails, make a punch! I highly doubt you want to be in your kitchen mixing cocktails while everyone’s watching the fireworks. 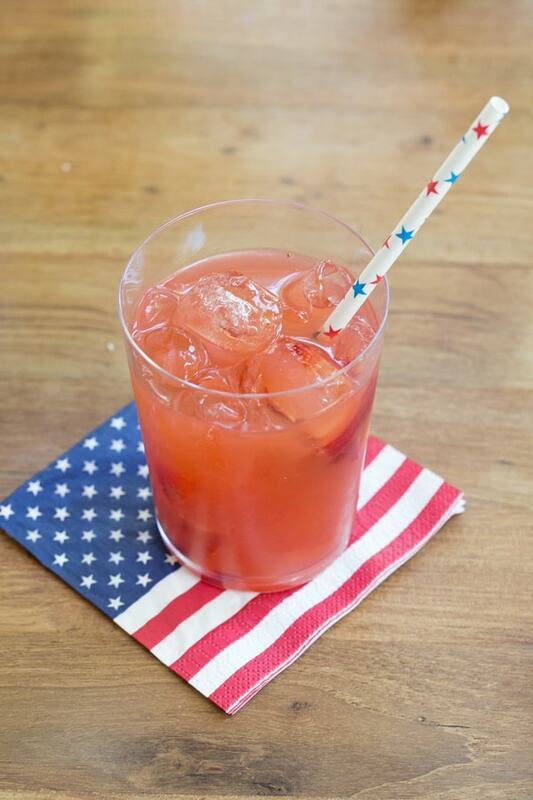 Instead whip up this crazy good bourbon punch to serve! 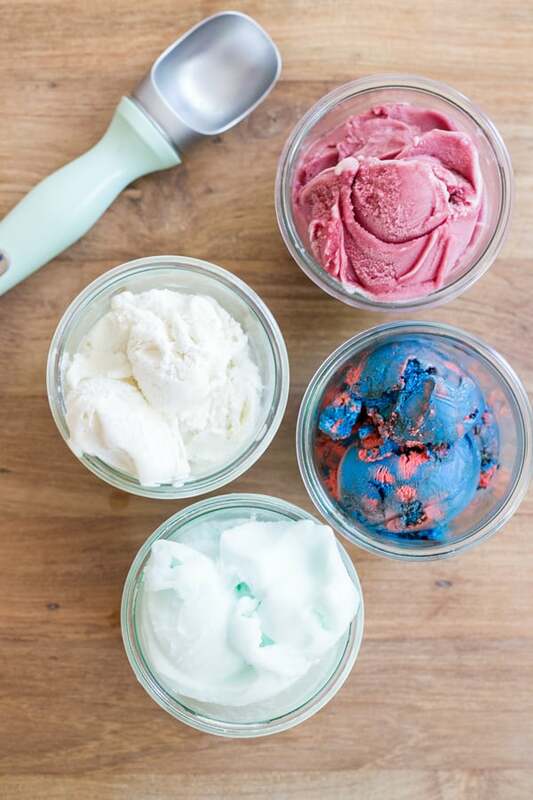 A few tips: Don’t add ice until a few minutes before guests arrive and make an extra batch to keep in the fridge for refills! Buy festive serving ware and details. We had fun teaming up with Coton Colors for the vases, serving tray, party bowls and appetizer bowls. I bought the flags at the grocery store and napkins at World Market. The Weck jars I use ALL the time. They are a staple in my kitchen! Don’t make everything! 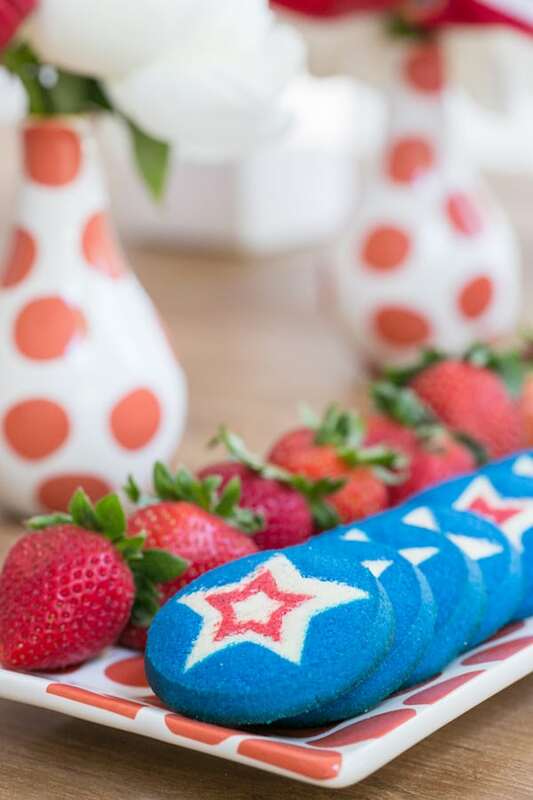 Seriously, if you’re hosting a dessert party just choose one or two desserts that will stand out (like our Red, White and Blue velvet cake!) and one spiked punch recipe. Then just buy the rest, like the 4th of July cupcakes, cookies, ice cream, fruit, etc. Make it easier on yourself. 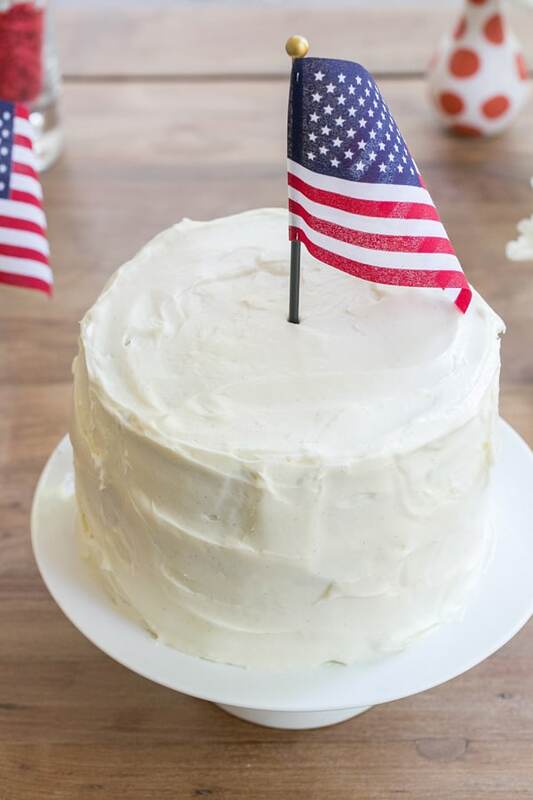 Recipe for our Red, White and Blue Velvet Cake is below (under the photos)… it’s the bomb! If you’re cooking for everyone too, break out the Crock-Pot! Ohhh yes, the one and only Crock-Pot. Make a big batch of chili to cook all day and then serve chili dogs and chips. Does it get any better? ha! 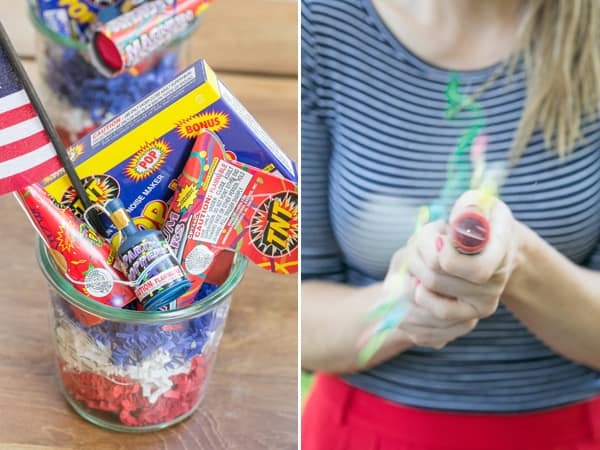 Make individual containers of 4th of July party poppers. I spruced mine up by adding some red, white and blue crinkle paper I bought at the Dollar Store. Flowers are EVERYTHING! Really, they add a lot to the decor of a party. 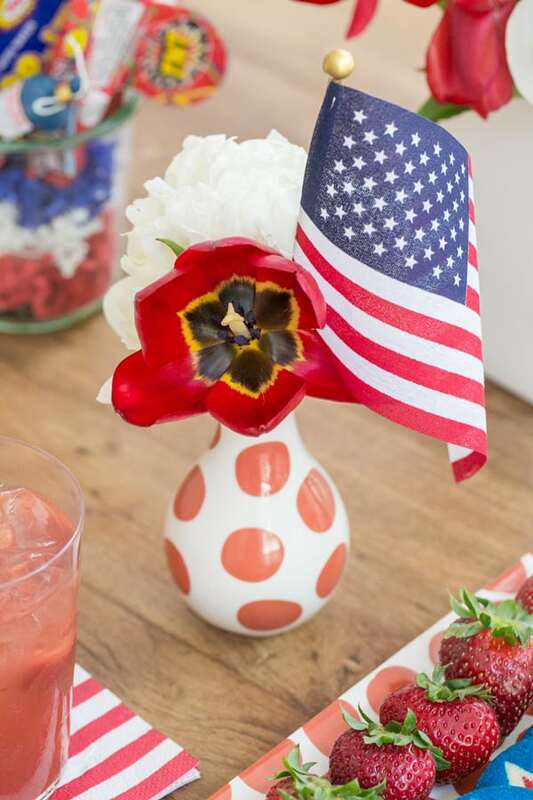 Just go to your local mart or grocery store and pick up some red and white blooms. I bought the white peonies and red tulips for $9… a deal I tell you. Switch it up and serve giant cake slices in these awesome galvanized serving baskets. 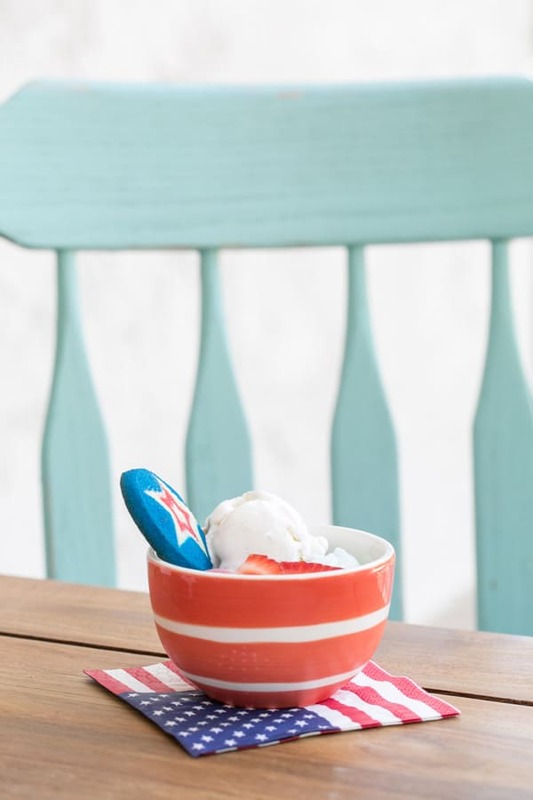 They’re the perfect size for ice cream (no spills! ), cake and fresh fruit! Bring the ice cream out when cutting the cake and let everyone serve themselves. I actually went to Baskin-Robbins (we have one right by our house) and bought pints of blue and red sorbet and a really cool Spider-Man ice cream which is red and blue swirl… insert Romeo’s happy face. To make the presentation nice, I transferred the ice cream into my beloved Weck jars. Also, place some waffle cones out for those who want to pass on cake and go for a triple scoop cone! It’s the 4th, let’s celebrate! 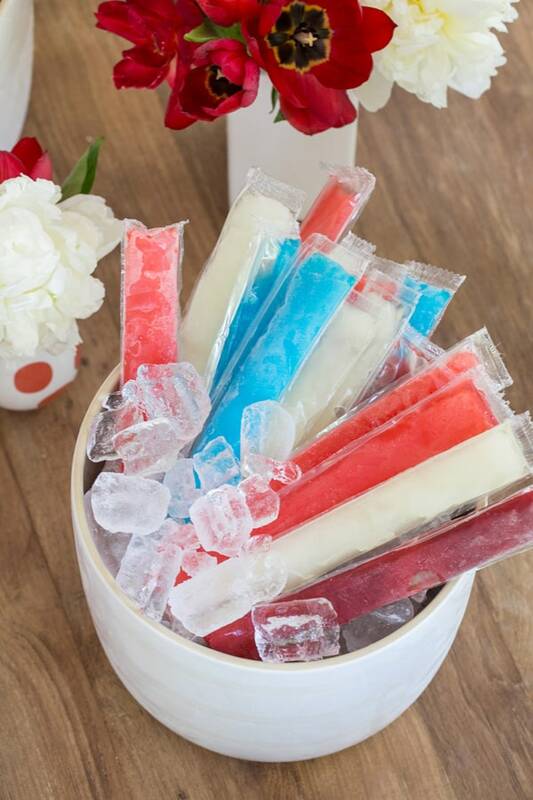 And don’t forget the old-fashioned ice pops for the kiddos! Red, white and blue all the way! Most important tips of all…. BE SAFE, have fun and relax! Use the recipe below 2 times to make 2 batters, one with cocoa powder and one without. The one without will be for the white part of the cake. With a stand mixer on medium-high speed, beat butter and sugar together until fluffy, about 2 minutes, scraping down bowl. Combine the wet ingredients, including the eggs into a 2-cup measuring cup and whisk. Add the dry ingredients into a bowl and lightly whisk. Add the buttermilk and flour mixture to the butter on low speed, alternating. Scrape down the bowl. Remove 1/4 of the batter and set aside. You’ll use this for the blue cake and add a little batter from the next cake batch as well. Dye the remaining batter red, mix and then pour into a 9-inch greased pan. Cook the cake for about 25 minutes or until done. Meantime, make another batch of cake batter. Don’t add the cocoa powder this time since this will be the white cake. Remove 1/4 of the batter and mix it with the batter you set aside earlier. Dye it blue. Bake the white batter and blue batter in 9-inch round pans for about 25 minutes or until done. Let all of the cakes cool completely before stacking. With a stand mixer, beat butter and sugar on medium-high speed until fluffy, about 2 minutes. Cover and refrigerate until ready to serve, up to 3 days. Happy Birthday America! You truly are the greatest! i didnt know you love “cooks illustrated”!!! ive seriously thought that i should send you a recipe for blonde brownies that i got from cooks!!! its so good! that cake sounds awesome too! happy 4th! Hey Sharon! Thanks for the comment! Absolutely love Cooks and yes, send the recipe to me (you’ll see the email in the contact section on the blog!). Have a great 4th and always nice to hear from you! Okay i will send it on at some point. You will love it! I cant believe the 4th is almost here!